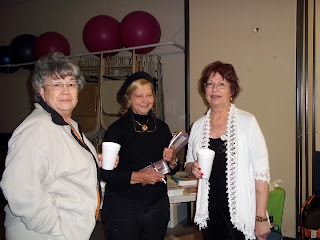 Thursday, October 27, 2011 the Paris TN Quilt Guild had a wonderful time with No. 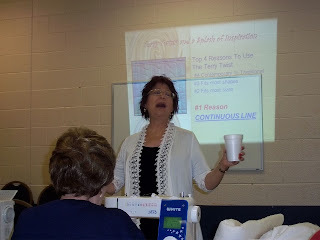 1 Quilting Author, Sally Terry, She is the author of many books such as, Pathways to Better Quilting and Hooked on Feathers. The day was filled with so much information and "AHA" moments. We learned that "if it looks pretty you don't have to rip it out". 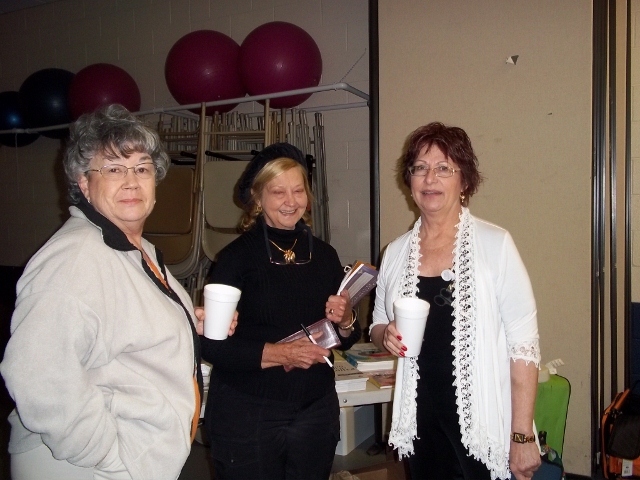 Sally is a delightful teacher and we look forward to another class with her soon. I wanted to make sure I got her bio correct so I copied this from her blog. "I feel I was born with an entrepreneurial spirit. Creating several business from scratch has given me valuable knowledge of marketing and business strategies which apply directly to professional machine quilters. 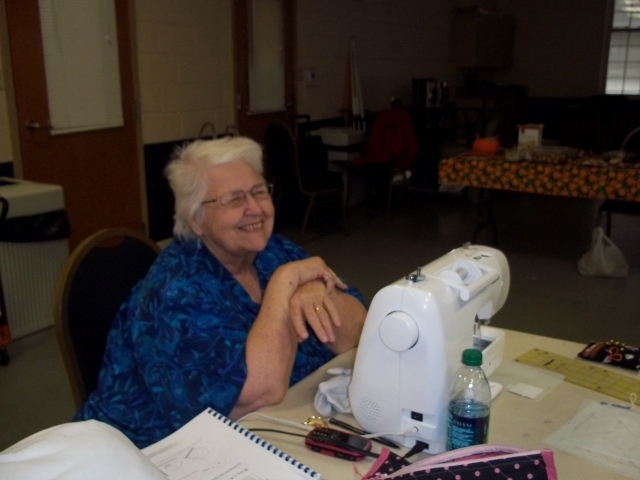 A lifetime of experiences in marketing, advertising and sales gives a fresh insight to machine quilters in today's competitive environment." Her joyful enthusiasm for sharing, results in full day workshops for longarm, midarm and shortarm machine quilters, in her studio, in Paducah. She also is a member of the Instructor Program for Janome-America Sewing Machines. Her teaching career includes MQX, MQS, HMQS, Innovations, Vermont Quilt Festival, quilt markets plus attends major shows and markets nationwide. 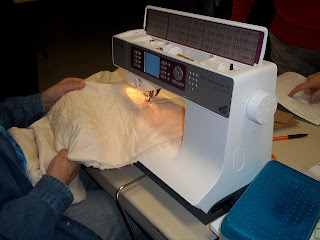 Most students feel she has a relaxed way of teaching machine quilting which encourages confidence and a joy of learning. Sally approaches the information in her classes from the student’s point-of-view with in-depth knowledge that is creative and inspirational. 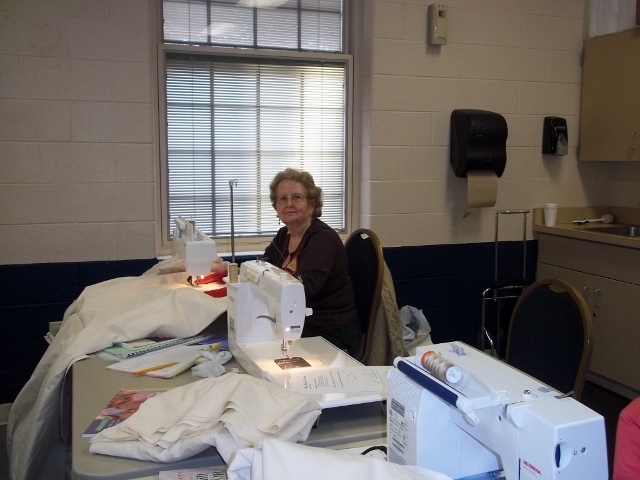 Sally specializes in running different threads, and free-motion quilting with a true touch of creativity. 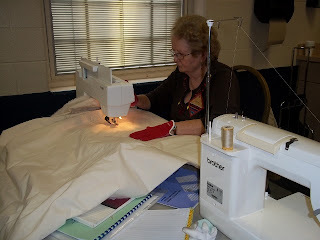 Many of her concepts have become common practice for beginning machine quilters. She feels that you do not have to copy her exactly to be productive and truly successful without unstitching. Here are some of the testimonials submitted by some of the members of our guild that attended the class. Kathy... "I had fun Thursday! 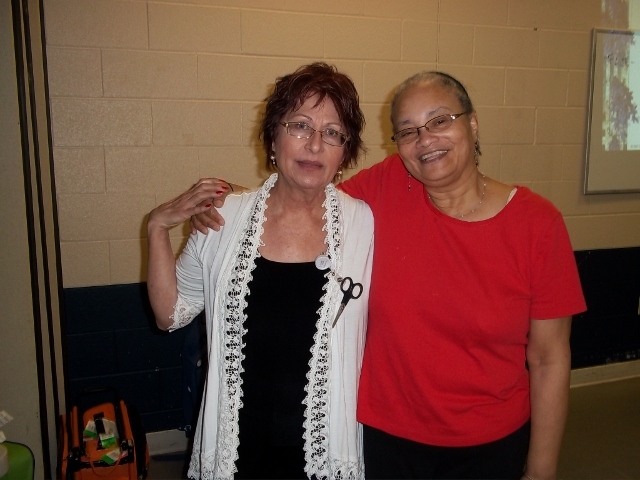 Every time I meet with Sally, I come away with new knowledge, and more confidence in my quilting. Her easy style of teaching helps you when you're learning something new, and the best part, perfection is not required. I've learned to be happy with my style of quilting. I'm looking forward to having another class with her. A genuine fun person who makes it easy to learn"
Enjoyed learning new techniques, including how to set the feeddogs, thread hints, and it is OK to be inconsistent! 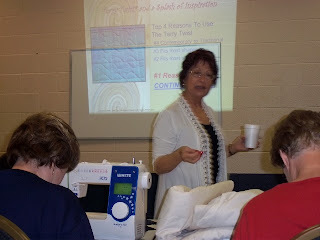 Shelly....I really enjoyed our class with Sally Terry, she was a delight and the day long class went by so fast. I really feel like I can improve my quilting using her method. Her basic 5 shapes open up so many possibilities for the quilter. I would recommend her class to anyone who needs help with their quilting and would love to attend another of her classes. I found her class to be fun, and as I tried what she was teaching, It got easier to do, she knows her stuff and is very interesting for sure. I would take another class in a heartbeat!